We are one of the specialized clinic/centers in Cryolipolysis or CoolSculpting in Delhi (South Delhi), India and treat 100s of patients in a month. This treatment is also known as Lipo Freeze. & is the best & fastest inch loss or body contouring treatment in Delhi available till now. Get the best Offer/Cost for Cryolipolysis or Cool Slimming/Sculpting in Delhi (South Delhi), India. Latest and Superior Machine with Teflon Handles is being used. WE ALSO OFFER THE BEST DOUBLE CHIN REDUCTION IN DELHI WITH CRYOLIPOLYSIS. Cryolipolysis: Lose fat by freezing it away! Lose upto 3-4 inches in just 1 session… Yes! You read it right. With CoolSculpting or Cryolipolysis one can lose up to 3-4 inches in just one session. Lose your extra inches and get your lovely shape back at our specialty centre, in South Delhi (CR Park), India (Very near to Gurgaon) at Care Well Laser, Skin & Anti Aging Clinic. FREEZE AWAY FAT ??? | Does CoolSculpting Work? What is Cryolipolysis or CoolSculpting? Also known as Cool-Slimming, Cryolipolysis is an effective procedure for removing unwanted fat from different regions of the body. It is a non-invasive treatment in which subcutaneous fat cells are cooled with the help of lipolysis and then the fat cells are broken down without affecting surrounding cells or tissues in the skin. After the method is completed, the fat content breaks down within two to four months and results in fat loss that appears entirely natural. Cryolipolysis is a trademark of Zelthiq Aesthetics Limited. The most common areas where the method is performed are stomach and back areas. Although most effective for getting rid of unwanted fat, Cryolipolysis/Cool-Slimming is not a permanent solution to fat loss since the method can't prevent the remaining fat cells from increasing in size. Therefore, after undergoing the medical process, patients have to maintain their fat either through exercise or through multiple treatment sessions. The best part of this unique method is that it has no recovery period, which means patients can get back to their normal life and activities soon after the treatment and they shall also keep distance from side effects. What is the Cost of Cryolipolysis or CoolSculpting (in Delhi) or Gurgaon? The cost of Cryolipolysis/CoolSculpting starts from Rs. 4500 in Delhi. Cost completely depends upon the machine & the center you opt for. However, Care Well Laser Skin & Anti Aging Clinic is a Cryolipolysis Specialized Center & offers the the best cost/price for Cryolipolysis/ CoolSculpting in Delhi, India. Cryolipolysis - Can you have this treatment instead of liposuction? The other weight loss or body contouring treatment involves a method of fat removal by damaging fat and destroying the cell with heat, radio frequency, ultra sound and chemical injections or by extracting them from the areas through minor surgeries like liposuction, whereas in this technique the layer of fat is reduced slowly without disturbing the other tissues present in the body. Cryolipolysis is a modern-day technique for inducing natural-looking fat reduction. It is a perfect alternative to invasive fat removal solutions like liposuction and therefore hardly has any recovery time. According to American Society for Aesthetic Plastic Surgery, although liposuction is immensely popular around the world with more than 396,000 treatments taking place alone in USA; yet Cryolipolysis is witnessing more number of people preferring it over liposuction and other invasive fat removal methods. There are mainly two primary technologies that are used for conducting the process. The 3-D lipo system is a combination of hand pieces for cavitation, dermatology, Cryolipolysis radio frequency and shockwave therapy for skin tightening, body contouring and cellulite reduction. The CoolTech is another way of treating the multiple body areas by means of a controlled cooling system. There are different hand pieces which help in adapting device to all body areas for achieving the full body contouring treatment. Way back in 2008, Dieter Manstein, R. Rox Anderson and their team demonstrated a process in which subcutaneous fat cells, i.e. cells situated between the skin and layers of muscles are more vulnerable to cooling effects as compared to surrounding tissues, under controlled condition and also that prolonged cooling of the fat cells can reduce the cell number, without affecting neighboring tissues. They referred this process as “selective Cryolipolysis”. It is not a permanent solution to get rid of excess fat content. It only reduces the number of fat cells that are already present. This method cannot prevent remaining fat cells from increasing in size either through diets and exercises or thorough multiple Cool-Slimming procedures. This unique treatment can also be amalgam with radio frequency technologies for skin tightening and enhancing results. Time taken for the procedure depends on two factors: the number of machines used for the process and the number of areas to be treated. Centres which have two machines take half the time, compared to those having one. These centres perform a procedure known as Dualsculpting. For example, if patients are treating their arms that require two applicators (one applicator per machine) and the centre just has one, therefore it will take an hour whereas if two machines are simultaneously used, the same procedure will take two hours. The time taken therefore varies from patients to patients. Cryolipolysis treats unwanted fat and reduces fat cells from certain areas of body, stomach and back being the most common. This treatment is not suitable for breasts and cannot be used for reducing cellulite. When patients want to opt for this method, they must first speak to the specialists and ensure if their desirable area is worth Cool-Slimming. 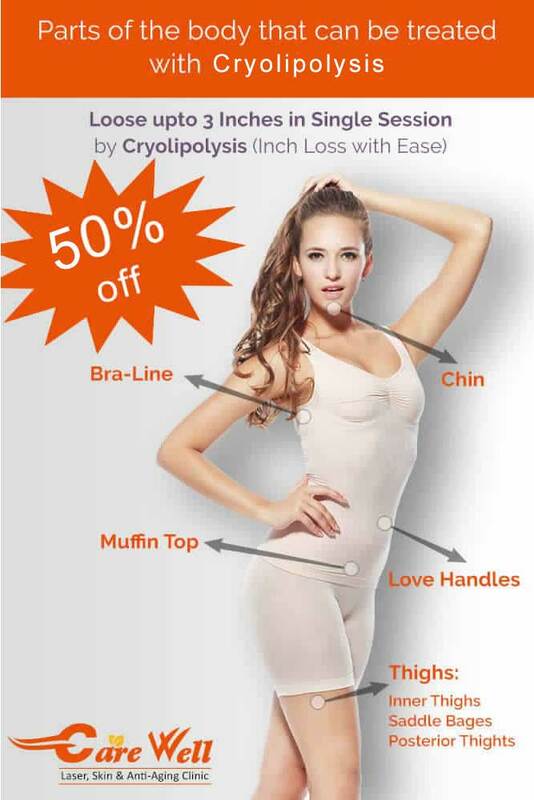 Also, Cryolipolysis is not meant for weight loss or obesity. It is not a substitute to invasive and larger fat removal techniques such as liposuction. What happens during a Cryolipolysis treatment? At first, patients and their practitioners decide the targeted areas to be treated. Prior to treatment, patients must freely discuss the causes behind opting for Cool-Slimming. They should also freely discuss things that are of medical importance and give a clear understanding to the surgeon about their present medical and health condition. It is also advisable to ask suitable questions to the specialists so that patients know how much they can achieve from the treatment. Practitioners can also show “before and after” images of the treatment for individual patient, few days after first consultation. During Cryolipolysis, two non-invasive cooling panels are applied to the targeted fatty regions of the skin. As a result, the fat area draws upwards between the two panels. Patients will experience a firm pull with little pressure; however it won't be painful. The fat cells are cooled for one to two hours. Right at the beginning, the treated area has a very cold sensation and after sometime patients won't notice the temperature anymore. They can freely relax their mind by chatting, reading books, listening to music or taking a nap. How long will it take to recover from treatment? As such, there is no recovery time for this procedure. Since it is non-invasive, therefore patients can immediately return back to their normal life, soon after the treatment. Often, some patients give a day or two and gradually get back to normal life. In rare cases, patients have soreness and redness in the treated area; which however heals in a week's time. What are the risks and potential complications from treatment? Cryolipolysis comes with no side-effects or complications. Since it is not a surgical operation, therefore it has no open wounds, which means no further risk of infection. Some patients do experience minimal complications such as bruising, swelling, redness, numbness, soreness and tingling which happen because of the fat tissues being drawn up between the cooling panels during the treatment. Any other side effects are temporary and disappear in few hours or days. What should you do after a treatment? Consuming pain killers for treating soreness or pain in the treated areas, as prescribed. Cold compresses for treating swelling in the treated region, as recommended. Most of the patients can return back to their normal activities on the same day of the treatment. However, if they suffer from any kind of discomfort, they must give rest for one to two days and then slowly come back to daily routine. They must also pay attention to extra washing and care in the treated areas of body. This will also prevent further complications. An ideal candidate for Cryolipolysis is someone, with good health and physically fit, however carries excess fat in body. Those who have tried dieting, exercising without any positive result, must not consider Cryolipolysis as an alternative to these measures. Cryolipolysis is also not a weight loss technique. It only reduces fat cells from the body which indirectly loses weight. Also, those suffering from other medical problems like obesity must never avail this procedure. To conclude, Cryolipolysis/Cool-Slimming is a simple, safe, effective and non-invasive procedure that has been designed to kill fat cells. Since the fat cells gradually die with time and release their content; therefore the end-result appears natural. This treatment can make a huge difference in one's looks and personality, especially if the person is already maintaining good diet and healthy lifestyle. Following the medical treatment, patients can have slimmer silhouette and lesser bulges which can hardly be noticed. Also, there are minimal side-effects which appear only in a few, if it is performed by trained and eligible practitioners. Looks improve; body gets into shape and well contoured. Life enhances in quality after the treatment and candidates opting for the procedure are more likely to feel better and confident in future.